SAVE money, energy, and water. LIVE better, waste less. GROW food and community with Transition Streets project. A novel eco-friendly project Initiated called as ‘Transition Streets’ which brings neighbors together to save energy, conserve water, and build community. Her goal is to facilitate a national roll-out of Transition Streets -- bringing this project to at least 100 neighborhoods (500 households!) across the US. Transition Streets is an effective, replicable and FUN project where neighbors come together to implement practical actions to lower our carbon footprints, conserve water, reduce waste, and strengthen our neighborhoods. Transition Streets enables you to take a number of effective, practical, money and energy-saving steps together with a group of neighbours, your friends or your family. A year ago they raised over $8,000 in a collaborative Indiegogo campaign to fund the initial phase of this project. Over the past year Transition US and their many collaborators have adapted the Transition Streets handbook for a US audience, piloted Transition Streets in 12 neighborhoods across the US, launched a Transition Streets website, and received some great media coverage – all on a shoestring budget, with the heart-full support of dozens of volunteers. Their dream is for Transition Streets to continue taking root in diverse neighborhoods across the country, empowering more and more people with the tools needed to cut household energy use, reduce water and waste, change how we eat and transport ourselves, and build stronger, healthier, more vibrant and connected communities. A handful of neighbors get together for 7 meetings. At each gathering, neighbors explore low-cost (and no-cost) action steps presented in a user-friendly handbook, resulting in reduced waste, lower energy and water usage (accompanied by lower bills), and the growth of healthier and more resilient local food systems, watersheds, and communities. Getting Started, Energy, Water, Food, Waste, Transportation and What's Next? Transition Streets is part of a wider movement of people working together to respond to climate change, economic instability, systemic inequality, and the other great challenges of our time. 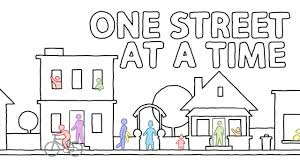 It all starts in our homes and neighborhoods, one street at a time. Transition US, national nonprofit hub of the worldwide Transition movement, develops and provides the tools for neighbors to make these changes together: the downloadable handbook, facilitator and outreach guides, and optional support from seasoned staff and fellow Transition Streets participants. Support and contribute to the eco-friendly project 'Transition Streets' at Indiegogo.